15 Main row houses are the veritable stuff of dreams, and, in an effort to ensure that anyone with the desire to snap up one of these cool, new, modern spots has a shot, we’ve done all we can to provide a variety of financing options to prospective buyers. Translation: no need for a 20% downpayment. 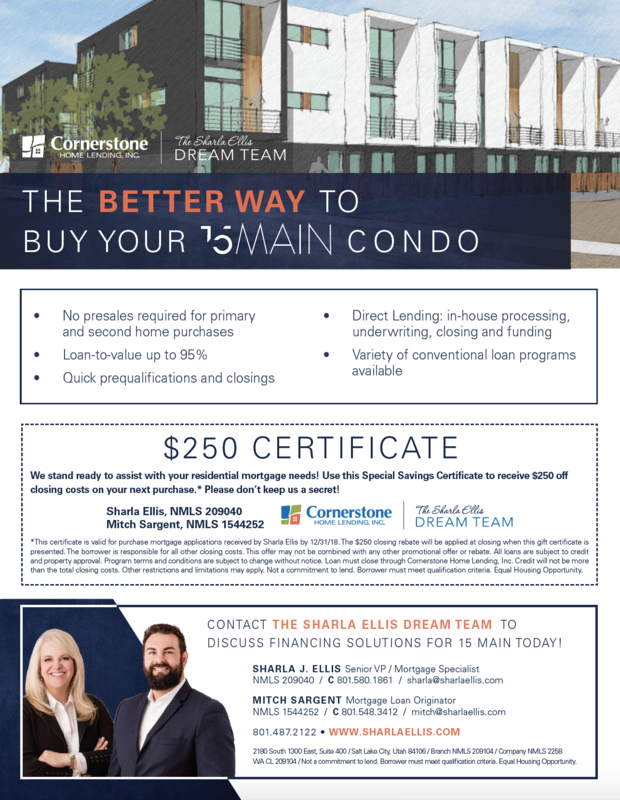 Instead, we’ve been working with two trusted lenders for months in order to have top-notch options up and running when 15 Main hit the market (click here to see the complete listings and details). Well, that day has come and, consequently, our lenders are raring to get you squared away. As far as specifics go, there are mortgage options that require as little as 5% down and an even more accessible 0% downpayment option is currently in the works. Plus, because 15 Main is just that good, both lenders are offering benefits that will make the process even more affordable (think: reduced closing costs and/or origination fees). As scary as row-house-buying can be, we’ve done everything we can to ensure financing will be as effortless and comfortable as your new light-filled living room. Welcome home, indeed. Contact cityhomeCOLLECTIVE agent Paul Svendsen to discuss your options at 801.441.8563. Place of Worship | Now Accepting Submissions!